Three men in South Florida are facing federal fraud charges after authorities allege the men took over control of about 80 houses in Broward and Palm Beach Counties, swapped the locks and then rented these units to tenants who had no idea the “landlords” weren’t the rightful owners. The four men, all from Palm Beach County, are facing charges that include mail fraud conspiracy and mail fraud. Bond is being withheld until a judge determines whether they should stay locked up while the case is pending. Authorities say this brazen scheme specifically targeted homes that were owned by a Georgia-based company in the business of buying and renovating homes and then renting them out. It’s unclear whether the men had any direct connection to the company. According to The Sun-Sentinel, the men launched founded a company called RHA Two LLC. This was very similar to the name used by the Georgia Company, which was RHA 2 LLC. In so doing, they were able to deposit rent payments that were obtained illegally and confound the real company. 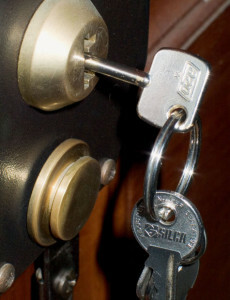 The men would locate homes that were under construction and then steal the keys from the lock boxes that were on site. When the construction was almost finished, they would contact a locksmith to have the locks changed. Authorities say the men then acted quickly, sometimes within hours, to post signs and advertisements indicating there was a home for rent. The number on the advertisements listed a prepaid cell phone number. Renters submitted their first and last month’s rent and security deposit and then signed a “lease,” though investigators say those agreements weren’t binding because the leasor didn’t own the property and had no right to rent them. Authorities estimate this cost the actual owner of these properties an estimated $100,000 per month in rental income. It is believed one of the men obtained more than $100,000 in cashier’s checks and money orders just in the first six months of launching the operation. Prosecutors are fighting to have the men behind bars while they await adjudication in the cases, saying they are a flight risk. A wife of one of the men reportedly transferred deeds to a home in Wellington worth $1 million back and forth between the two of them several times over the course of the past several months. While the two do own the home, they don’t have a substantial amount of equity in it. Her husband is also facing unrelated charges for identity theft and bank fraud. Investigators say he faked an identity to open several checking and credit card accounts so he could charge a myriad of personal expenses, including payments on two luxury vehicles, medical bills, university bills and others. All total, investigators say that fraud scheme alone racked up $260,000. Defendant used mail for purposes of executing or attempting to execute a scheme. Because the potential prison time in these cases is substantial, it’s imperative to hire an experienced criminal defense attorney.